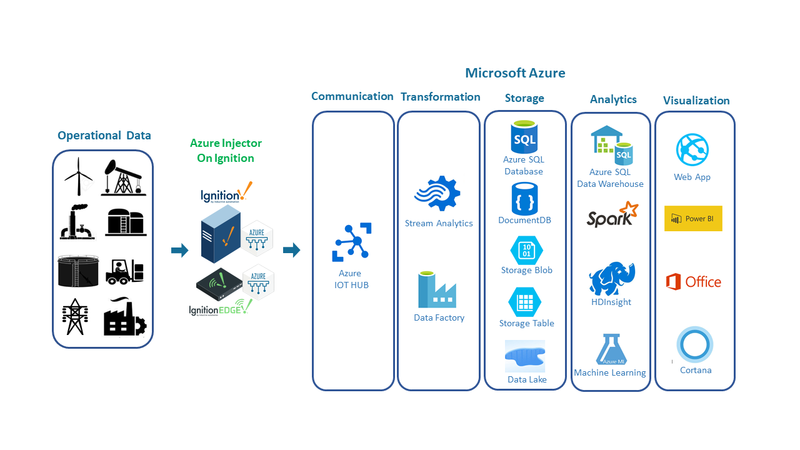 The AZURE Injector Module easily connects any tag data from Ignition into the Microsoft Azure cloud infrastructure through the IoT Hub. With a simple configuration, tag data will flow into the Azure IoT Hub using an easy to read JSON representation. The diagram below shows how the Cirrus Link Azure Injector Module connects OT data to Microsoft Azure Cloud Services. Operational data is published to the Azure IoT Hub using MQTT and made available to all the Analytic tools Azure has to offer.